This contemporary Westcoast home is overflowing with style and technology. The owner uses it for winter and summer family vacations and wants everything about his experience there to be elegant and easy to control. Our custom designed touch panels make controlling this luxury home incredibly easy and intuitive. All technologies are accessed and controlled from the main touch panels or any iPhone or iPad. The floor plan based display makes it clear to the user exactly what’s playing, what windows are open, or what the temperature is at a glance for every room in the house, amongst a myriad of other features. Everything ties in to one main system including: lighting, shading, music, TV, rooms and pool temperatures, security, and surveillance. Lights, shades and music are controlled from elegant keypads in the wall. Each has custom engraving to make setting the lights as easy as pressing a single button for any mood. Music too, is at your fingertips, just press the button and music turns on wherever you are. A fully customized downtown penthouse condo. Three separate suites were combined into one 3000 square foot space with 300 degree vistas. 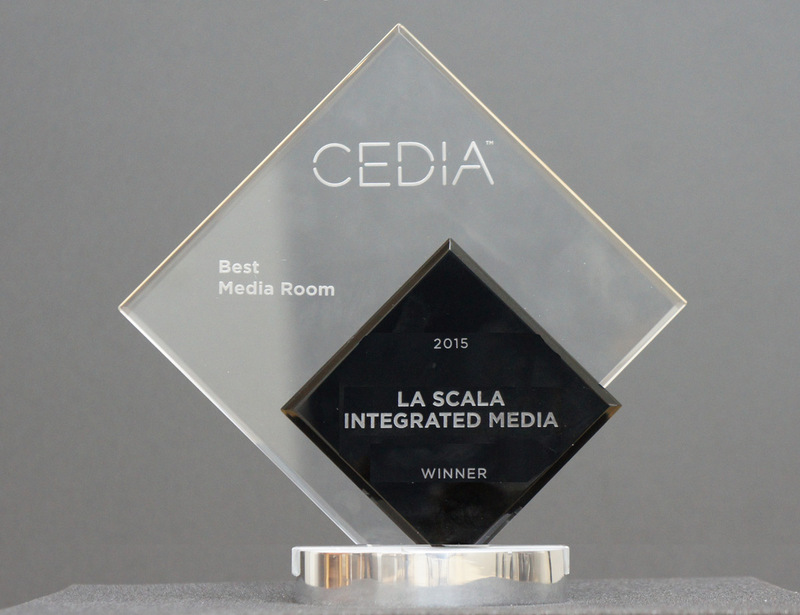 La Scala fully integrated the lighting system, designed and installed motorized shades, and heating and cooling control. We closely collaborated with the designer to use technology to deliver their vision of the space. 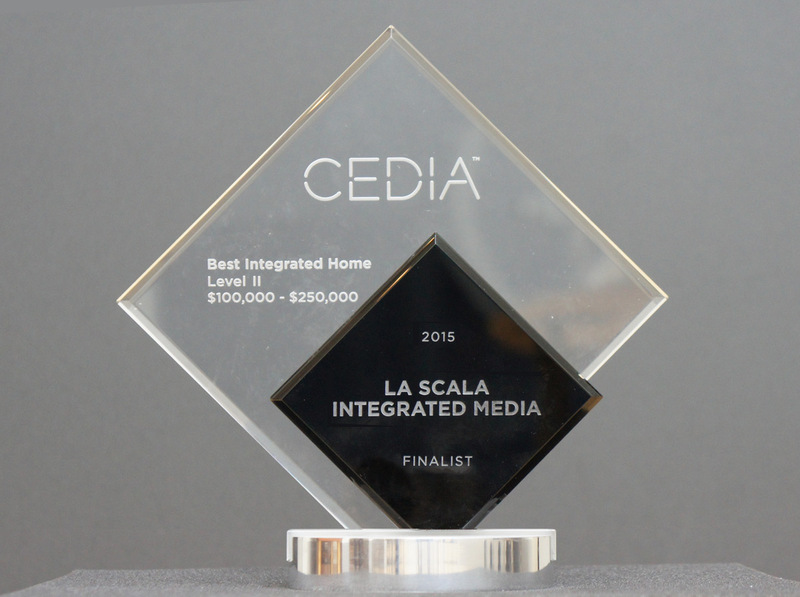 Encompassing the following components, La Scala artfully assembled and executed the installation, programming, and testing of a Media Room that is truly an example of La Scala’s best! Beginning with an acoustically transparent 12 foot customized Stewart Filmscreen ‘MicroPerf’ screen which features a native 2.35:1 viewing aspect ratio to faithfully recreate films for viewing as intended by the director, plus motorized masking over top of the screen to allow for a conversion to a 1.33:1 or a 4:3 aspect ratio to view Hollywood classics such as Casablanca in their original intended viewable format, plus a DPI M300 projector, then adding seven Bowers and Wilkins (B&W) LCR and surround speakers, and complimented by four Triad sub-cinema 12″ subwoofers perfectly balanced with DSP magic ensuring a constant, even, and smooth sound level across the entire front row, La Scala had the ingredients for a true thoroughbread. Finishing details in the room were suspended walls and specially designed acoustical treatments in both the structure of the theatre as well as the fabrics and wall coverings, which ensured a perfect acoustical environment. Proper planning and documentation of produces predictable results and helps manage costs. 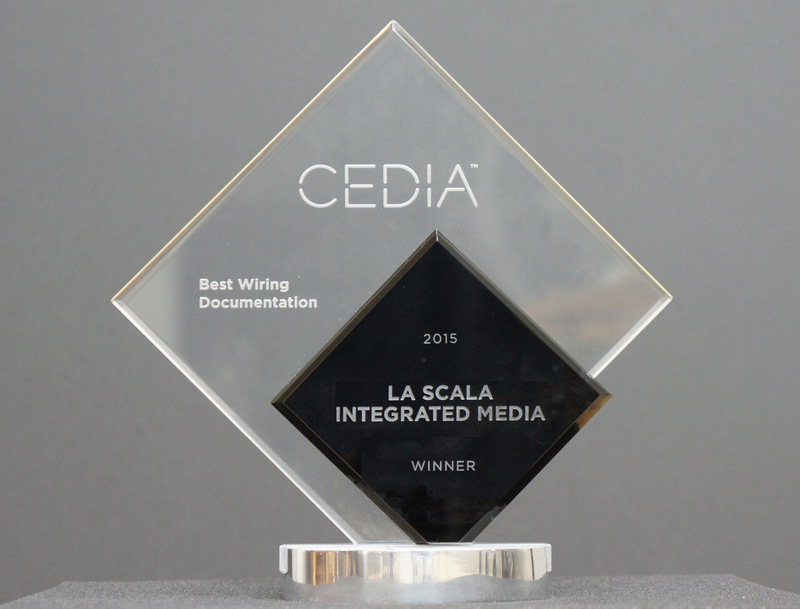 The La Scala team works with the latest Computer Assisted Design workflows as well as traditional drawing collaborations with our architectural and design partners to ensure that we’re always ‘on the same page’. We specify thermal requirements, wiring specifications, millwork pre-planning and structural considerations for our centralized equipment enclosures, motorized and static mounting platforms, and all the way up to pocket specifications for motorized window treatments. 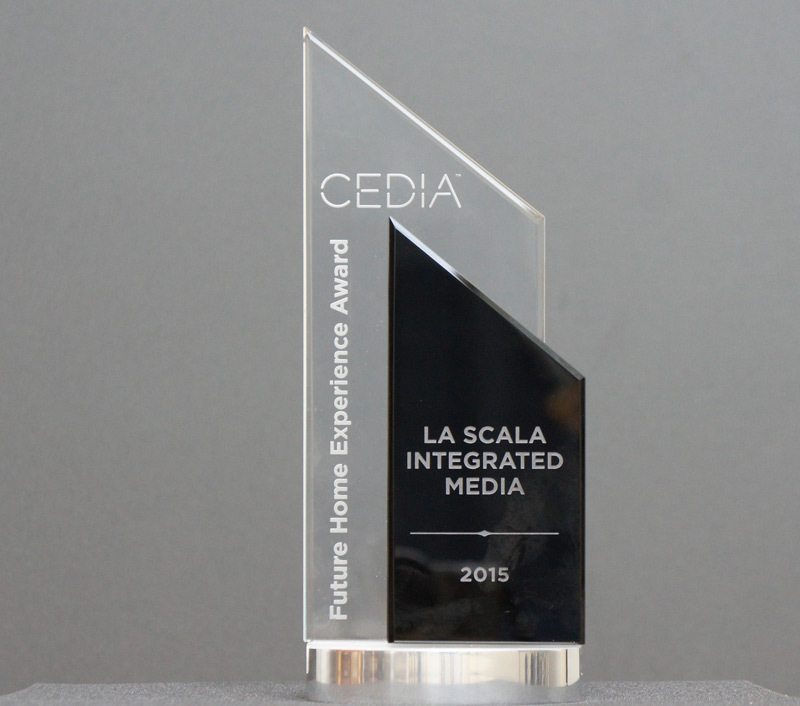 From The Custom Electronic Design and Installation Association (CEDIA): This award recognizes the one project amongst all CEDIA Award categories and entries which best exemplifies the Future Home Experience and the concept of ‘Life Lived Best at Home’™. Leading integration-technology industry experts from around the World chose La Scala for this award as they recognize La Scala to be the leader in creating the best technology experiences in homes today, and that La Scala is a trend setter for technology experiences for homes of tomorrow.